The Palazzo Giaracà is a historic palace which had a substantial renovation to make it a comfortable, spacious building and a unique facility of its kind. 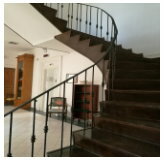 Located in Ortigia island and built in 1892, this charming building was designed by Carlo Sada, the renowned Italian architect Carlo Sada who also designed Teatro Bellini in Catania. The Palazzo Giaracà is a great class structure, where different architectural styles found their sublimation. 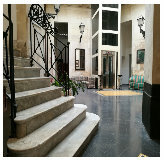 The palace is equipped with all necessary amenities to make your stay in Siracusa joyful and unforgettable. You can choose between different types of rooms, depending on your needs: double single use, double standard, double superior, double superior sea view, triple, quadruple and junior suite. A unique city. The old town of Siracusa is an island named Ortigia, colonized by Greeks in 734 BC. Siracusa gave birth to the great mathematician Archimedes and at the top of its greatness the city had the reins of the entire Mediterranean, just before the advent of Rome. Ortigia is joined to the mainland by two bridges, one historic and the other built about twenty years ago. 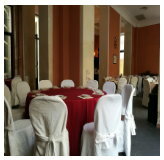 Hotel Palazzo Giaracà has great outdoors inside this beautiful building - just take a look at our GALLERY. As you can see the high ceilings seemingly endless and the intricate design of the rooms make this Hotel one of the most unique in Siracusa. 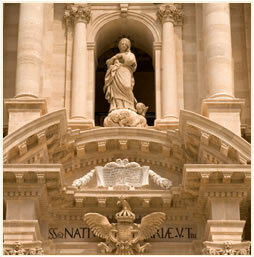 Siracusa has been named UNESCO World Heritage Site in 2005.